It's an old adage that "you learn something new every day". It happened to us again at the commemoration on April 5, 2008 of the 250th Anniversary of the capture of Mary Jemison sponsored by the Biglerville Historical & Preservation Society of Biglerville PA. We were not aware that there is a Memorial monument placed near the site where, on the second night of their travail, the other members of Mary's family and the other captives were killed by the French and Indian war party. Mary and the little boy that was spared did not witness the deed because they had been led away from the others by an Indian. 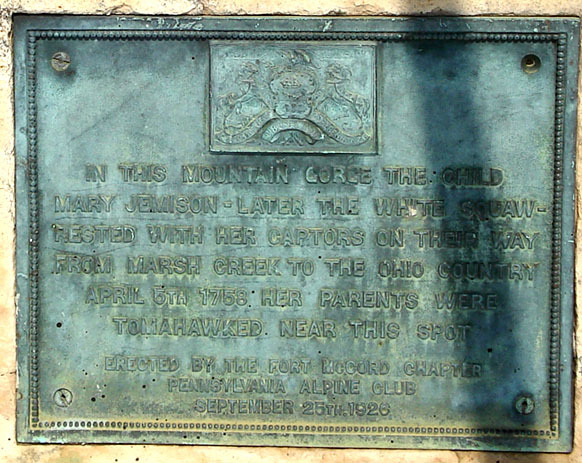 The marker was placed by the Pennsylvania Alpine Club in 1926, just three years after her statue was erected at the St Ignatius Loyola Catholic Church. 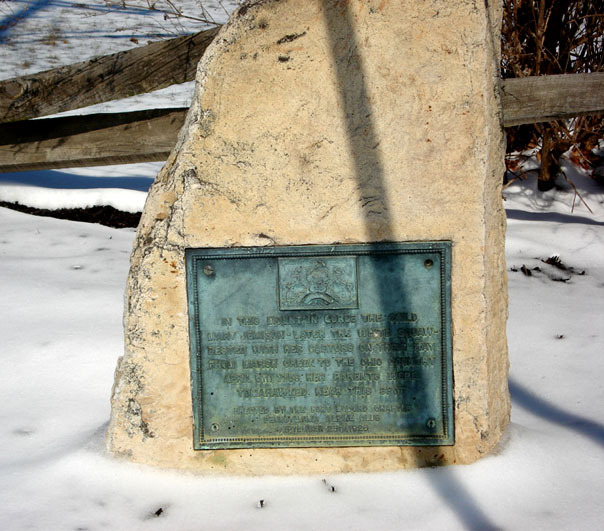 The photo of the marker was provided by John Bechtel of the Adams County Historical Society. 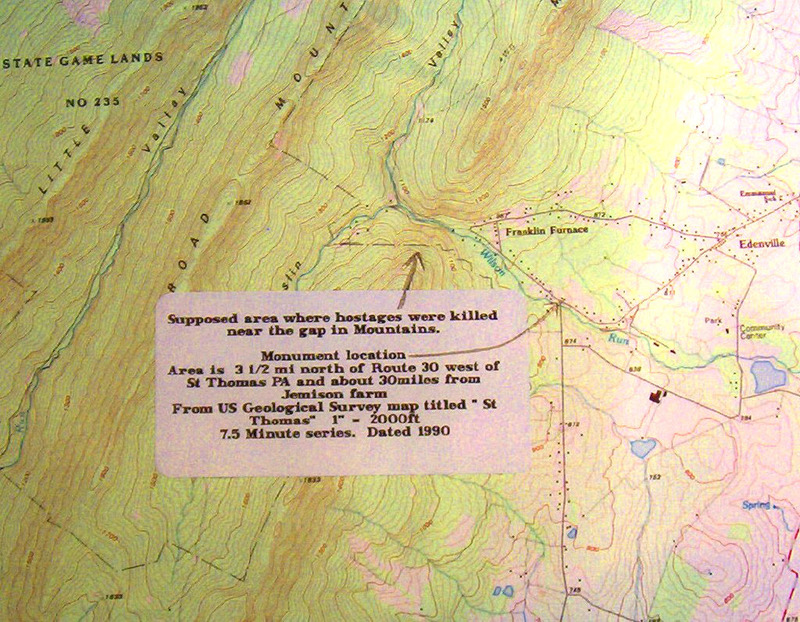 The topographic map (below) is an adaptation to show the area where this incident is believed to have occurred. Local legend has it that the party utilized the various "gaps" in this mountainous terrain to ease their travel and make movement faster to avoid trailing rescue parties.The journey took eight days. For more information, see our April 5th 2008 Ceremonies, Glimpse of Mary Jemison, and other material on her life found in the Mary Jemison section our "Pieces of the Past." Special thanks to John Bechtel for sending us the photograph! The top of the map is north, the Jemison farm was located about 30 miles east (right) and the party was headed west (left) to reach territory occupied by the French at Fort Duquesne which is now Pittsburgh.